I am really pleased how this one turned out. The only problem I was having was my paints kept drying out too fast - will be glad when winter arrives - makes painting in acrylics a lot easier. The Shining Bronze Cuckoo is the worlds smallest cuckoo measuring only 15 - 17 cm long. They can be found around Australia, New Zealand, Indonesia, New Caledonia, Papua New Guinea, Solomon Island and Vanuatu. 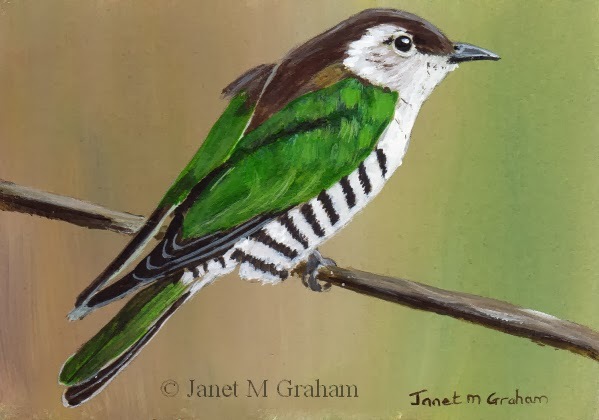 Shining Bronze Cuckoo measures 3.5 x 2.5 inches and is painted on 300gsm smooth Arches watercolour paper. I love this birds colouring. I used a mixture of Ultramarine Blue, Transparent Yellow and Permanent Alizarin plus white to create the orange feathers. This bird can be found throughout Northern Europe and Asia. It winters in southern Europe, Northern Africa, North India, Northern Pakistan, China and Japan. 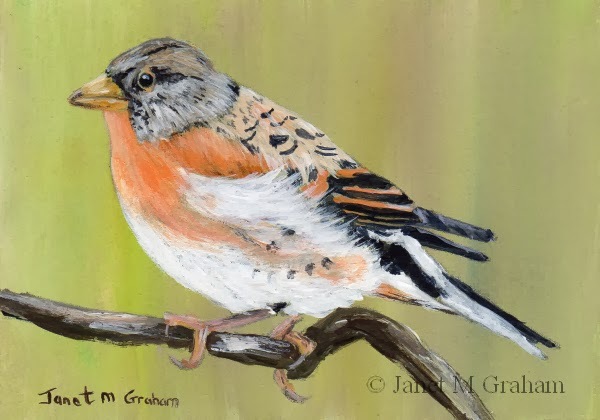 Brambling measures 3.5 x 2.5 inches and is painted on 300gsm smooth Arches watercolour paper. So this was the next one that I painted. I love painting the pink robin - brings back memories of my holiday to Tasmania. Very happy how it turned out. Maybe a should paint a series of watercolour robins - I will have to see what other reference photos I can find. 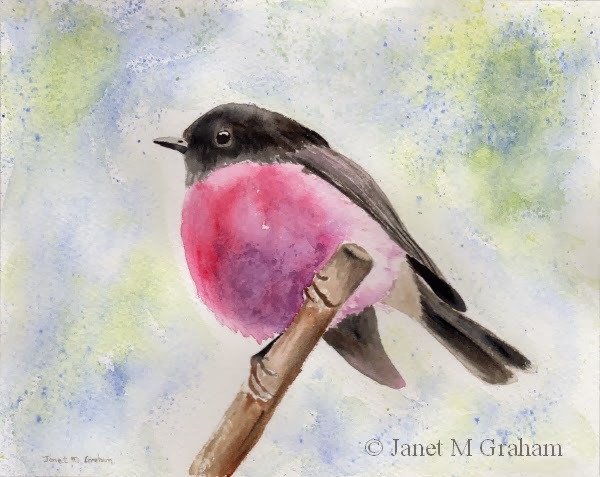 Pink Robin measures 10 x 8 inches and is painted on 300gsm rough Arches watercolour paper. I felt like a needed to paint a few looser style paintings before tackling my next detail 6 x 8 inch and 6 x 6 inch paintings. So I decided to paint a couple of birds in watercolours for a change. The first one is this lovely European Robin. Really pleased with the end result. I added the pink flowers to add a bit of interest. 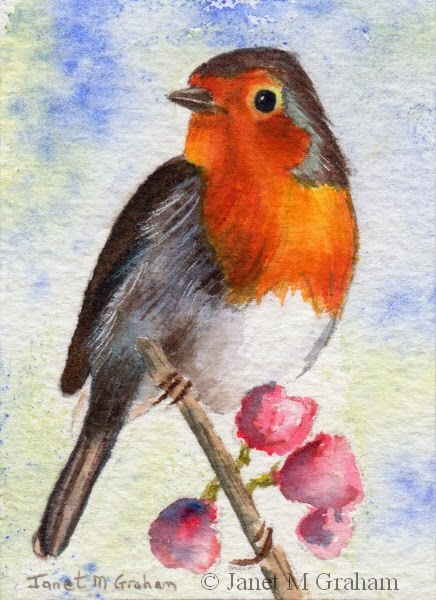 Robin measures 2.5 x 3.5 inches and is painted on 300gsm rough Arches watercolour paper. The painting is available for purchase from my Etsy store. To view the listing, please click here. I couldn't resist painting this little fellow - he is just so cute. I am really pleased how he turned out - it all just seemed to come together.. 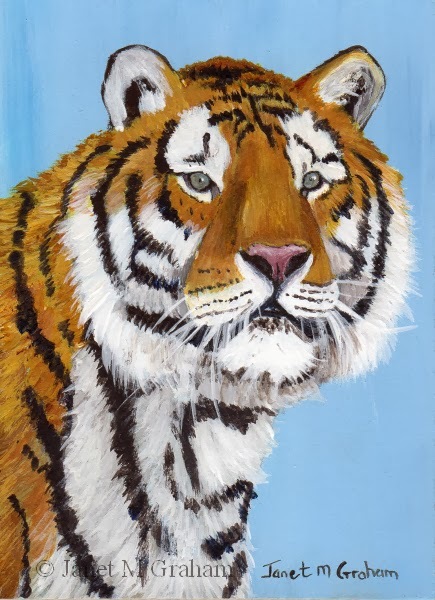 I used the same colour combination as I did for the tigers fur - I just added a bit of burnt umber so vary the colour here and there. 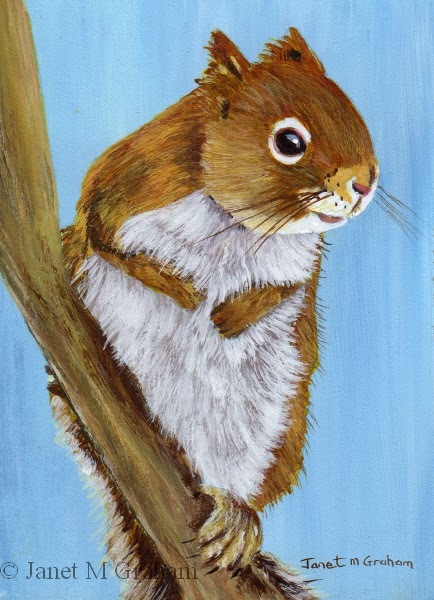 Red Squirrel measures 2.5 x 3.5 inches and is painted on 300gsm smooth Arches watercolour paper. I am really pleased with this one. I found the perfect mixture for the tigers fur - a mixture of Permanent Alizarin Crimson, Transparent Yellow and Ultramarine Blue - works beautiful. It has been really hot and humid here for the last week or so. Fingers crossed the cool change will come through this evening. Tiger measures 2.5 x 3.5 inches and is painted on 300gsm smooth watercolour paper. I enjoyed painting this one - it all just worked. Really pleased with the result. These birds are found around the most of Australia (they are not present in Tasmania). They are also found in Papua New Guinea and Eastern Indonesia. They are about 9 - 10 cm in length and weigh around 7.5 - 11 grams. 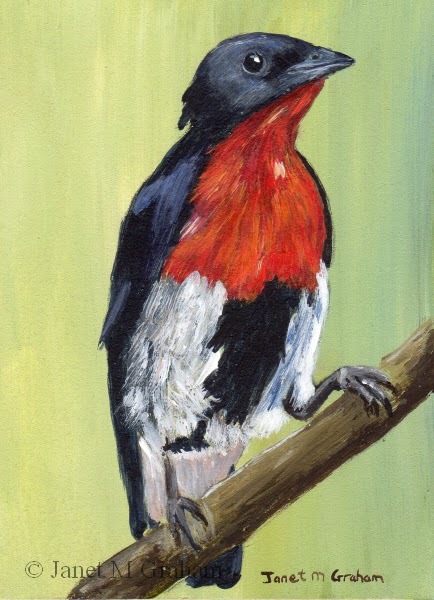 Mistletoebird measure 2.5 x 3.5 inches and is painted on 300gsm smooth Arches watercolour paper. This one also just worked. I love it when painting just work. These birds are found around the arid and semi arid interior of Australia. They measure around 11 cm in length and weight between 9.6 - 13 grams. 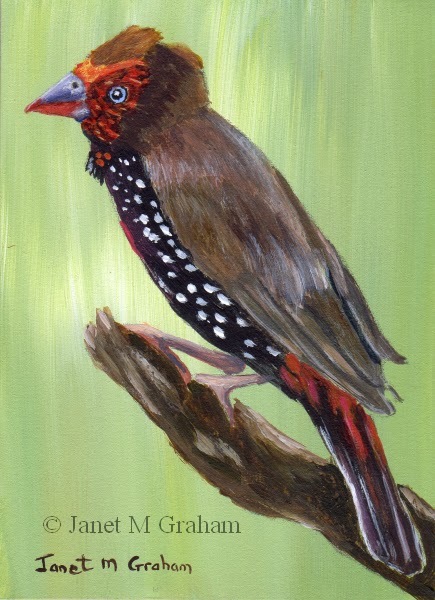 Painted Firetail measures 2.5 x 3.5 inches and is painted on 300gsm smooth Arches watercolour paper. I felt like painting something just for fun so decided to paint this cherry. I used quite a few layers of yellow and red to paint the cherry. Wasn't sure if I was going to leave the background white but decided it would look rather striking with a black background so go for it. 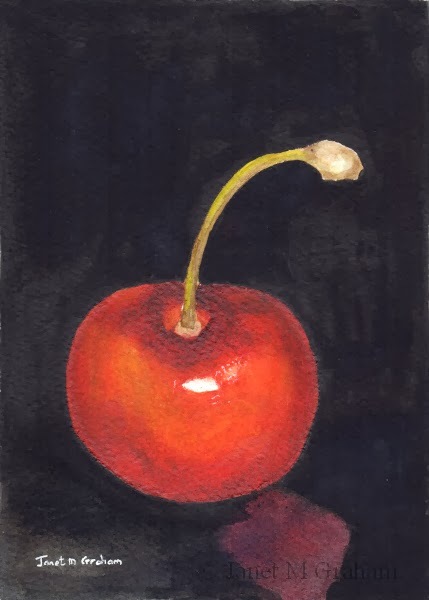 Cherry measures 5 x 7 inches and is painted on 300gsm rough Arches watercolour paper. I love the colouring of this bird. It was interesting painting it as it was a bit of a challenge to get the pink / red balance correct. These birds are found across Northern Europe and Asia to Northern America, Iceland, and Greenland They around 11.5 - 14 cm in length and weight around 12 - 16 grams. 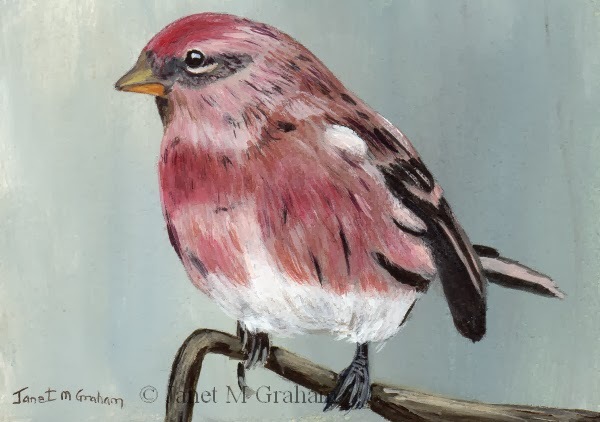 Redpoll measures 3.5 x 2.5 inches and is painted on 300gsm smooth Arches watercolour paper. I enjoyed painting this one. The back feathers were a bit tricky but I got there in the end. There birds are found in few countries around Africa from Kenya, Ethiopia, Sudan to name a few. 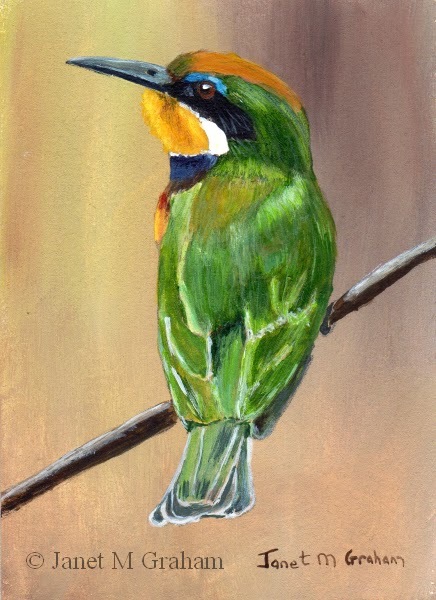 Blue Breasted Bee-Eater measures 2.5 x 3.5 inches and is painted on 300gsm smooth Arches Watercolour paper. I have been wanting to paint this one for ages and finally got around to it. He is just so cute. Really pleased with how the final painting turned out. 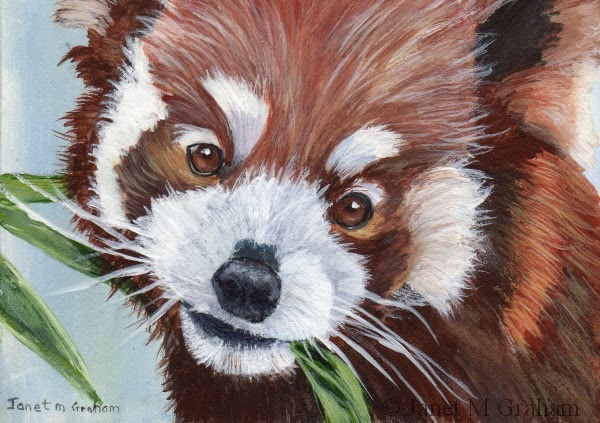 Red Panda measures 3.5 x 2.5 inches and is painted on 300gsm smooth watercolour paper. I photographed this lovely cat at Australia Zoo a few years ago. I must actually see if I can visit there again this year. I only like going during the cooler months so will see latter on this year. I final placed my order for my larger panels. Since I like both the Ampersand Panels and the Raymar panels I ended up ordering 24 Ampersand panels and 20 Raymar panels. They should all arrive next week which is great as I have quite a few larger painting planned for the next few weeks. 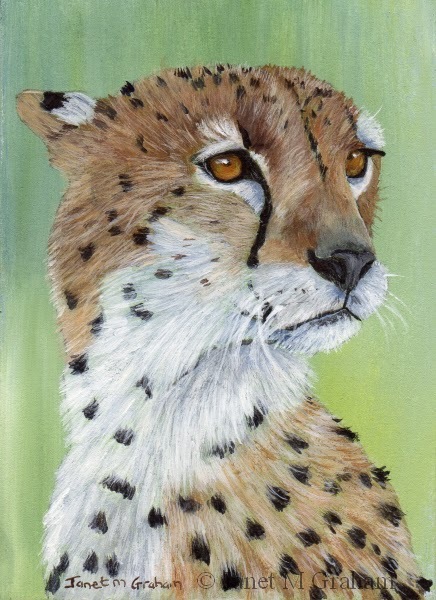 Cheetah measures 2.5 x 3.5 inches and is painted on 300gsm smooth Arches watercolour paper. This ones background also proved to be problematic. I decided to try something different and make it more like grass reeds in the background. Will that didn't work - the background was too busy and was distracting attention away from the bird. Fortunately I was able change it without having to start over again. Cedar Waxwings are found North and Central America. They are about 15 - 18 cm in length and weigh around 30 grams. 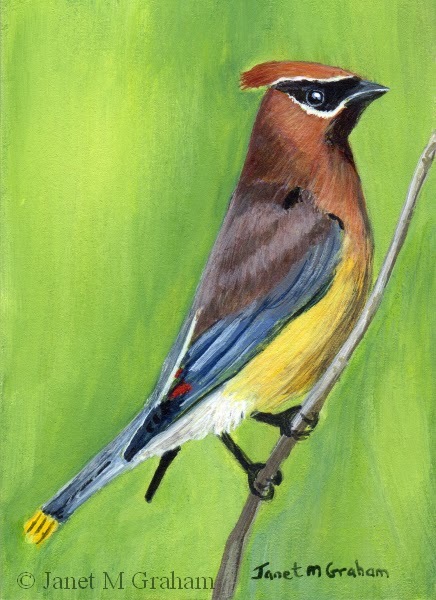 Cedar Waxwing measures 2.5 x 3.5 inches and is painted on 300gsm smooth Arches watercolour paper. I had to do this one twice. I thought I had done the background dark enough but when I was half way through painting the bird, it just was not working. I tried darking the background but that didn't work so I ended starting again from scratch. Rather pleased how it finally turned out. These birds are widely found across Europe, North Africa and South East Asia. They have also introduced into Australia and New Zealand. 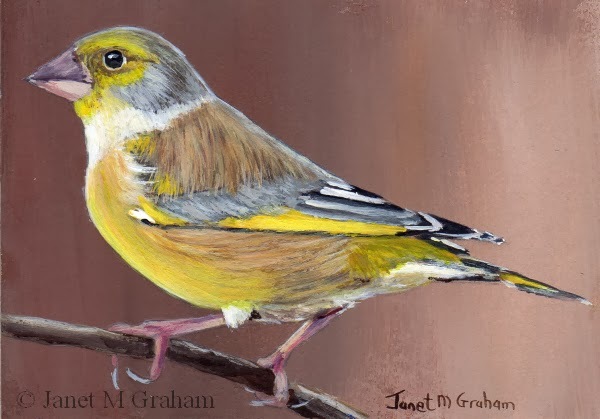 Greenfinch measures 3.5 x 2.5 inches and is painted on 300gsm smooth Arches watercolour paper.